The TMA Garden would still be a pile of dirt if it weren’t for the help of our community of parents, teachers and local businesses. To show our gratitude for those who support our community, we’re going to spotlight a very special TMA garden contributor-David Spinoglio. 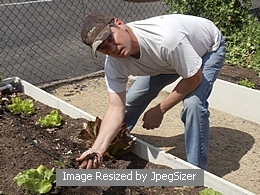 He’s a dedicated parent volunteer who works for a well know local business that supports our garden, Irvine Company. In the early stages of our garden, David and Irvine Company Office Properties landscape vendors contributed to our project in many ways. With his help, the Irvine Company provided all the irrigation materials for the TMA Garden, including an automated weather satellite irrigation control device. The Irvine Co. picks up the monthly subscription charges for the device. This water conservation device has become an integral part of the success of our garden. It’s so great to have automated weather-based system to apply the right amount of water to keep our plants and trees healthy. Our trees are laced and many plants and trees donated to the garden at no cost to us by the Irvine Company’s landscape vendors. The TMA garden would not exist without remarkable parents like David, who dedicate countless hours and resources to our garden and generous companies like the Irvine Company and their vendors. Thanks to all of you.